Hannah Kim poses after a shot from the fairway. The junior finished in a tie for eighth individually at the Stanford Intercollegiate, Northwestern’s final fall tournament. It was more of the same this weekend for Northwestern at the Stanford Intercollegiate, where the Wildcats got out to another hot start before playing themselves out of competition in the second round. NU led the tournament by two strokes after round one, shooting 1-over as a team. The Cats were once again led by junior Hannah Kim, who fired a 2-under round and was tied for second on the individual leaderboard. Day two was a different story, as the wind and rain led to a 23-over round from the Cats. It was also a different story for Kim, who fired a 4-over round and finished tied for eighth individually after round three was cancelled due to rain. NU’s 23-over was the third-worst round of any team in the 16-team field on Saturday and dropped the Cats to eighth overall, their second straight less-than-stellar result. 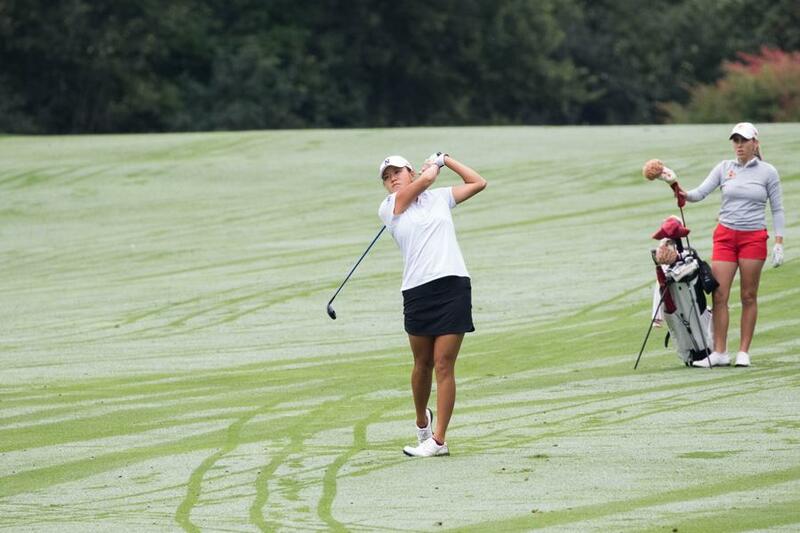 Senior Kacie Komoto was responsible for two of those triple bogeys on day two, en-route to a 7-over second round. After carding a 3-over in round one, Komoto ended in a tie for 45th overall in the tournament, her worst finish of the year so far. Komoto was not the only NU golfer to struggle. Sophomore Stephanie Lau finished at 8-over for the tournament after shooting 9-over in the second round, while junior Sarah Cho ended tied for 53rd at 11-over on the weekend. Sophomore Janet Mao had the second best finish of the team in her tie for 18th, but she also shot 4-over on Friday with a double bogey of her own. The Cats will have plenty of time to get out of their own way as a disappointing fall season comes to a close. After returning its entire starting lineup from the team that took ninth at last year’s NCAA Championships, NU went winless and managed only two top-five finishes in its four fall tournaments. The Cats return to action in February with the Northrop Grumman Regional Challenge.